Weather: Muggy day with mostly cloudy skies and S wind at 15-20 mph. High of 91. James Hahn hit 17 of 18 greens in regulation to shoot the only bogey-free round on Thursday, a 6-under 64 in the opening round. Hahn holed more than 120 feet of putts in the 29 putts he required to shoot 64. Hahn finished T5 in his first appearance at the AT&T Byron Nelson in 2014. He followed with a T55 in 2015 and a T46 last year. In his fourth appearance, Hahn’s 64 marks his lowest score in 13 rounds at TPC Four Seasons Resort. In 12 previous rounds in this event he’s shot 65 four times, including in the opening rounds in 2015 and 2016. Hahn’s career low on TOUR is 62, twice, both in 2013 (R4/CareerBuilder Challenge, R4/Waste Management Phoenix Open). He’s never shot 63 and Thursday’s round was his fourth career 64 on TOUR. Hahn is a two-time winner on the PGA TOUR. After missing eight consecutive cuts, Hahn recorded a playoff victory over Roberto Castro at the 2016 Wells Fargo Championship. 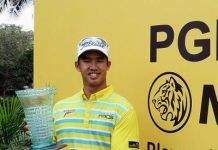 He also won the 2015 Genesis Open. Hahn, making his 125th career start on TOUR, owns ten career top-10s including two wins. His lone top-10 result in 16 starts this season is ninth at the CIMB Classic. Hahn missed the cut at last week’s PLAYERS Championship. Hahn currently sits at No. 105 in the FedExCup standings. After joining the PGA TOUR in 2013, Hahn has advanced to the FedExCup Playoffs each season, with No. 40 last season his best finish. Hahn is currently ranked No. 83 in the Official World Golf Ranking. His highest position in the ranking was 52nd which occurred following last year’s AT&T Byron Nelson. Ricky Barnes mixed eight birdies with two bogeys for an opening-round 6-under 64, his low 18-hole score in his ninth consecutive appearance in the AT&T Byron Nelson. Barnes’ previous low was 66 (twice), most recently in last year’s third round. Barnes has made the cut six times in eight previous starts in this event. His best result was T12 in 2013. Barnes is seeking his first PGA TOUR victory in his 255th career start this week. His best finish on TOUR was runner-up to Lucas Glover at the 2009 U.S. Open. After missing 10 of 15 cuts to start the season, Barnes, currently No. 197 in the FedExCup standings, has made the cut in his last four consecutive starts since the Valero Texas Open. His T22 at the Zurich Classic of New Orleans amidst that stretch, where he teamed with Australia’s Matt Jones, is his best result this season. Barnes’ opening-round 64 is his best opening round at any tournament since a first-round 63 (-7) at the 2016 Sony Open in Hawaii, where he shared the lead with four other players. He went on to finish T56. The only other first-round lead in his career came at the 2013 Zurich Classic of New Orleans after a 64 (-8), eventually finishing T42. Although the last two champions went on to win after holding at least a share of the opening round lead, first-round leaders have not fared well over the previous 63 editions of this tournament. Only eight players (nine times) have carried the opening-day lead on to victory, including Sergio Garcia (2016), Steven Bowditch (2015), Jason Day (2010), Scott Simpson (1993), Tom Watson (1979-80), Mark Hayes (1976), Chi Chi Rodriguez (1972) and Earl Stewart (1961). Only two players have won the tournament in wire-to-wire fashion – Mark Hayes in 1976 and Tom Watson in 1980. 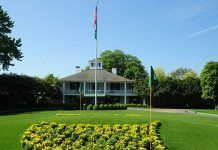 (Note: Complete first-round scores are not available for the inaugural event in 1944, which was won by Byron Nelson). The first-round leader/co-leader has won four times in 26 stroke-play events this season, most recently Justin Thomas at the Sony Open in Hawaii. Matt Kuchar opened with 4-under 66. In Kuchar’s 10th appearance at the AT&T Byron Nelson, his previous low opening round was last year’s 5-under 65. Kuchar’s low round in the event is 5-under 64 in the third round of 2015 when par was reduced to 69 because the par-4 14th hole played as a par-3 due to the weather conditions affecting the course. Kuchar has yet to miss a cut in nine starts at the AT&T Byron Nelson (T39-2007, T42-2008, T39-2009, T6-2011, T15-2012, T33-2013, T7-2014, T39-2015, 3-2016). Thursday’s 4-under 66 by Venezuela’s Jhonattan Vegas marks his tournament low in 16 trips around TPC Four Seasons Resort. Vegas’ T49 at last year’s AT&T Byron Nelson is his best showing in four previous starts in this event. Vegas sits No. 15 on the Presidents Cup International team list with 2.15 points. At No. 10, Canada’s Adam Hadwin has 2.64 points. The top 10 will make the team to be announced in September, along with two additional picks by captain Nick Price, the 1991 AT&T Byron Nelson champion. After starting the round at No. 10, Jason Kokrak posted two birdies and two bogeys before making the turn. Four additional birdies on his incoming nine resulted in a 4-under 66, marking his lowest score on TOUR since a second-round 65 at The RSM Classic earlier this season. Kokrak’s only other appearance at this event was 2012 when he missed the cut. In 145 career starts, Kokrak is seeking his first win. He owns two runner-up finishes, most recently at the 2016 Genesis Open. 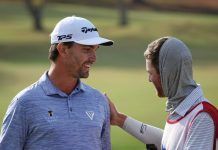 In search of his first career PGA TOUR win in his 208th PGA TOUR start, Mission Viego, Calif. native Cameron Tringale reeled off an eagle, four birdies and two bogeys for a 4-under 66. Tringale is looking to post his best finish at the AT&T Byron Nelson after missing cuts in his two previous appearances (2011/71-78, 2010/71-77). His lone top-10 showing in 18 starts this season is T8 at the Genesis Open. Tringale has finished second on the PGA TOUR three times; 2014 THE NORTHERN TRUST, 2015 Zurich Classic of New Orleans and 2015 Shriners Hospitals for Children Open. FedExCup leader and world No. 1 Dustin Johnson’s string of sub-par opening rounds at the AT&T Byron Nelson continued with Thursday’s 67. For the eighth time in eight starts Johnson has begun the tournament with a round in the 60s. Johnson owns four top 10s in seven AT&T Byron Nelson starts (T63/2008, T4/2009, T7/2010, T20/2011, T7-2014, T8-2015, T12-2016). Sean O’Hair’s first-round 67 included five birdies and a double bogey at No. 14. Since a runner-up finish in his tournament debut in 2005, O’Hair has not finished in the top-10 in nine starts. Brooks Koepka, who lost to Sergio Garcia in a playoff at this event last year, bogeyed his final two holes (Nos. 8 and 9) to shoot 3-under 67. Eight of Koepka’s last nine rounds at the AT&T Byron Nelson are under par. Here’s a look at his most recent scores here; 67-71-65-64-65-67-64-68-69. Among his four top-10 finishes this season, Koepka has recorded two runner-up results, at the Shriners Hospitals for Children Open and the Valero Texas Open. This week is Ryan Armour;s 94th career PGA TOUR start and 11th this season. The 41-year-old bogeyed the final hole to finish 3-under 67, hitting just 10 of 18 greens and ranking T3 in scrambling with 7 of 8. Armour has made five cuts in 10 starts with a T36 at The RSM Classic his best showing after ranking No. 32 on the Web.com Tour priority list to regain status for this season. Armour is making his third start at the AT&T Byron Nelson after missing the cut in two previous appearances (2008/79-76, 2007/70-72). As a PGA TOUR rookie, Armour earned three top-10 finishes in 2007 when he retained his PGA TOUR status by finishing No. 121 on the money list (T9/AT&T Pebble Beach Pro-Am, 4/OHL Classic at Mayakoba, T6/Valero Texas Open). The three top-10s remain his only career top-10s on TOUR. In the 1993 U.S. Junior Amateur final in Portland, Ore., Armour lost to Tiger Woods, 1-up in 19 holes. 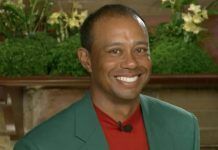 It was Woods’ third consecutive U.S. Junior title. After missing the cut in 2014 and posting a T4 last year, Bud Cauley is making his third start at the AT&T Byron Nelson. Last year, Cauley opened with a 6-under 64, just a stroke off the lead. Since shooting 70 in the first round of his first appearance at the AT&T Byron Nelson in 2012 and then withdrawing from the tournament, John Huh has now recorded five sub-70 opening rounds at this event with Thursday’s 3-under 67. Huh finished T8 at this event in 2013. With Thursday’s 68, Jordan Spieth has now opened the AT&T Byron Nelson with six sub-par rounds and one even-par round (70/2014). Spieth made his PGA TOUR debut at the 2010 AT&T Byron Nelson at the age of 16, finishing T16. The 23-year-old is playing the AT&T Byron Nelson for the seventh time (T6-2010, T32-2011, T68-2013, T37-2014, T30-2015, T18-2016). Defending champion Sergio Garcia’s opening-round 73 (+3) marked his second-highest opening round in 13 appearances. His highest start in the tournament is 75 in 2006. Eight past AT&T Byron Nelson winners are in the field this week: 73/Sergio Garcia (2016, 2004), 80/Steven Bowditch (2015), 70/Brendon Todd (2014), 69/Jason Dufner (2012), 74/Keegan Bradley (2011), 68/Jason Day (2010), 75/Rory Sabbatini (2009) and 69/Ernie Els (1995). At the suggestion of 2015 AT&T Byron Nelson winner Steven Bowditch, players, officials and caddies wore Rubik’s Cube stickers to show support for fellow PGA TOUR professional John Senden and his family. Last month, Senden announced he was taking indefinite leave from the TOUR after his son Jacob was diagnosed with a malignant brain tumor. The Rubik’s cube is one of his son’s favorite toys. Round One: Morning Scoring Average (70.88) vs. Afternoon Scoring Average (72.96). The par-4 14th hole played the toughest on day one with a 4.526 average. The par-5 7th hole played the easiest at 4.494.